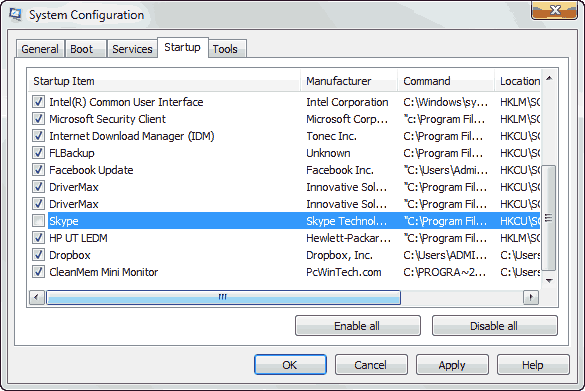 MSCONFIG is the Microsoft System Configuration tool that allows you to manage devices, applications and windows services that run at startup. Whenever you install new programs most of them tend to start at your Windows startup. This is because these program developers want to start the program for you as quick as possible. So they start the program at your Windows startup and the program eats your PC’s memory as well as other CPU resources and hence slows down the startup as well as the processing. Open “msconfig” either by typing it in start menu search or typing it in run dialog box. Run dialog box can be opened by pressing the “Win + R” key combination. Then you need to go to the “Startup” tab. This tab shows you all the softwares and applications that run at windows startup. Deselect all the applications that you use less often or you feel are heavy and can be run when you really need them. REMEMBER Don’t deselect your antivirus from this list. It should be on all the time. Finally click the OK button and if it asks for a system restart, do it if you have saved all your work, else you can restart it anytime (your settings are saved). Most of the time when we install any program it registers itself to run at startup. But most of the programs we have are used very rarely. So what’s the point in letting them start every time we start our PC. Moreover they slow down our startup and even the processing, because some of their files permanently reside in the memory. So MSCONFIG is the best tool to remove them and you even don’t have to spend on it.